Bipolar disorder is a complicated mental health illness that is easily mistaken for other problems like ADHD or regular depression. One way a doctor diagnoses the type of bipolar disorder a person suffers from is by looking at the symptoms the person has. While not everyone who has bipolar disorder will suffer from all of the signs and symptoms of it and the symptoms usually vary in type and severity from person to person, there are certain common bipolar disorder symptoms that are usually found. These symptoms can occur in both men and women. While most of these signs of manic depression usually first manifest themselves in a person’s teens or twenties they have been known to occur earlier or later in some cases. The one trait that all people who have bipolar disorder share is that each person with this condition will have at least one manic or mixed-manic event during their lifetime. That is one of the hallmark symptoms of bipolar disorder and a key factor in its diagnosis. Mania is a high-energy state of mind where the individual is likely to have a positive mood. The individual is likely to seem extremely energetic and in the case of the milder Bipolar II disorders is often highly productive when in a state of mania or hypomania. This is the “happy” mood that tends to go in cycles with other moods. A manic episode may occur more often and be more severe in those who suffer from Bipolar I Disorder (commonly called manic depression), occur seldom or even just once and be less severe in those who have Bipolar II disorder, and be even milder for those with the mildest form of bipolar disorder, cyclothymic disorder. Depression is another key component of bipolar disorder. In Bipolar I, the classic form of bipolar that most people think of when thinking of this condition, the individual will go through phases of deep depression followed by manic state, leading to a recurring cycle of dramatic and unpredictable moods. People with the milder Bipolar II disorder usually experience more major depressive episodes than they do manic episodes. Often people with bipolar disorder will experience mood swings for no apparent reason. For example, depression sometimes comes upon people who are bipolar even though outwardly it seems like they have no reason to be depressed. Irritation is often noticed in both the manic and depressed states. It is usually found more often in those who have a milder form of the disorder. Also, if symptoms of mania and depression are both experienced at the same time irritability is often a response. Another common symptom that appears in both the manic and depressed states are sleep issues. When a person experiences a manic state the result is often insomnia and difficulty sleeping. During a manic phase, many individuals will end up sleeping only a few hours a night. If the person is in a depressed state, often all he or she feels like doing is sleeping. It isn’t uncommon for those who are bipolar and depressed to spend 15 hours a day or more sleeping. Inflated ego or self-esteem is often seen in individuals who have bipolar disorder and are currently in a manic phase. The individual is likely to seem narcissistic or overly confident based on their particular skills. For instance, this inflated self-esteem can result in feelings of entitlement that lead to destructive behaviors like spending sprees when money is tight. Constant fatigue is commonly associated with the depressed state of mind. People with bipolar depression tend to not only sleep more but they also tend to feel constantly tired even after sleeping for several hours or more. That fatigue is commonly seen during depressed phases, but is eliminated during the manic phase. The feeling of hopelessness is a common symptom when a person is in a depressed state. As a result of feeling hopeless and helpless, some individuals will have suicidal thoughts during this time. The rate of attempted or successful suicide is much higher in bipolar disorder than most other forms of mental health problems. Rapid speech is another common symptom of the disorder. Those who are in a mania phase will start talking over others and will seem particularly chatty. The key difference between someone who is naturally talkative and those who have bipolar disorder is the fact that the bipolar individual is not always so talkative and his speech occurs in a more rapid rate than is usual for him. During a manic phase – whether a mild or severe version – it is common for a person who is bipolar to jump from topic to topic. This is called the flight of ideas. Except in extreme cases when a person’s jump among topics makes their thoughts appear disorganized, listeners can usually follow when a bipolar person jumps from topic to topic. This jumping in topics can make the bipolar individual seem to have attention deficit issues. Because of this it is sometimes common for people who are bipolar to be misdiagnosed with attention deficit disorder. While there are additional bipolar disorder symptoms, the 10 listed above are the most common and are the most often seen in individuals who suffer from this mental condition. Do not diagnose over the internet. If you think you or a family member may have bipolar disorder, contact your doctor or medical health care provider for an accurate diagnosis. Treatment is available and can help. Men and women who suffer from bipolar disorder are more likely to struggle with alcoholism or similar substance abuse behaviors. It is believed that roughly 50 percent of all individuals who have bipolar disorder will also struggle with alcoholism. 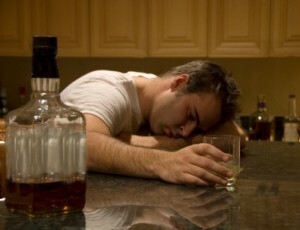 The problem is that alcoholism will usually have a negative impact on this mental health condition. The reason that drug abuse or alcoholism and bipolar disorder often go hand in hand is the element of self-medication. The individual who has bipolar disorder will often drink alcohol during a manic phase to help slow down the mental processes that seem to fire in rapid succession and make it hard to focus on one task. During a depressed state of mind, alcohol is used to try lifting the mood and creating a happier state of mind. The problem with self-medication is that ultimately it can lead to severe alcoholism or drug addiction that causes a dual-diagnosis of both the disorder and substance abuse. It complicates treatment because some of the behaviors a person exhibits are related to alcoholism while others are related to his or her bipolar disorder. This usually requires that doctors must deal with the effects of alcohol use and/or withdrawal at the same time they are striving to treat the bipolar mental health disorder. Beyond simply causing a dual-diagnosis of two difficult to treat problems, alcohol use can actually worsen the bipolar disorder as well. The more an individual drinks, the worse the symptoms of bipolar become. In many cases, the constant alcohol use will start shortening the time between phases and will make the symptoms in each state – manic and depressed – gradually worsen over time. Though these two issues are difficult to deal with it is possible treat both issues. The faster treatment begins, the better control the individual has over the behaviors. Bipolar disorder in children shows slightly different symptoms from adults, though some signs are still common between the two. In children, it is important for parents to notice the signs early and get a diagnosis as quickly as possible so appropriate treatment can be started as soon as possible. Children who are diagnosed with bipolar disorder are often placed on a spectrum based on the severity of symptoms. The earlier treatment begins, the better a child is able to cope with the changes in his or her mood. In children, mood swings are likely to occur over shorter periods of time than adults, so it is important to get treatment quickly. Bipolar disorder is a complicated mental health condition that requires treatment. Without appropriate behavioral and medical treatments for the problem, the condition and severity of symptoms suffered can become worse. Fortunately, treatment is available that can help control the symptoms and provides needed support to handle the changes in mental state. For information on available treatments for depression, please click here.